Reston, VA – February 1, 2012 – (RealEstateRama) — Calkain Companies’, a national real estate investment brokerage firm, recently completed a complex 1031 transaction involving two (2) zero-cash-flow properties (“zero(s)”) occupied by CVS (NYSE: CVS.) The purchaser was a large family LLC motivated by the foreclosure of an office building they had previously owned. The circumstances of the foreclosure are unable to be disclosed due to the confidentiality agreements currently in place, but the parties orchestrated an amenable foreclosure, which allowed a 1031 exchange. As a result of the foreclosure, the LLC had a debt obligation of approximately $22MM that needed to be replaced with the purchase of new assets. Purchasing highly leveraged, zero cash flow CVS properties allowed the LLC to complete a 1031 tax deferred exchange, meeting its debt obligation with minimal equity contribution. This transaction allowed the LLC the opportunity to defer taxes and re-invest in passive real estate. Calkain’s Jerry Burg, Managing Director and Andrew Fallon, Associate facilitated the transaction, providing exclusive representation and advisory services to the LLC. Since a foreclosure is a taxable event, Calkain advised the LLC in executing this 1031 foreclosure strategy for several months. When utilized in a Section 1031 tax deferred exchange, a zero is a unique form of Replacement Property which enables the property owner to defer the taxes resulting from the transfer of a Relinquished Property with the smallest amount of equity needed to close the transaction. Zeroes are highly leveraged properties, with investment grade tenants and all rental income produced from the assets are ultimately allocated towards the servicing of the debt that is in place, thus producing “zero cash flow” for the property owner. Burg points out, “The sector of the triple net lease investment (NNN) market which seems to be the most conducive to zeros are the drugstore chains. 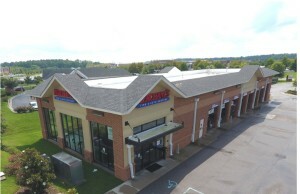 The stability of the industry, high-traffic locations, long lease terms, and the creditworthiness of public companies like CVS and Walgreens make their newer freestanding buildings ideal candidate properties.” Calkain diligently identified the most appropriate replacement properties for the family trust. Fallon continued, “The same fundamentals that apply to the selection of any real estate apply to zero properties. Like in most net lease investment evaluations, location, quality of tenancy, rental income, and residual value were all factors in establishing overall value for this portfolio.” The two CVS properties ultimately purchased by the trust were both located on the east coast.